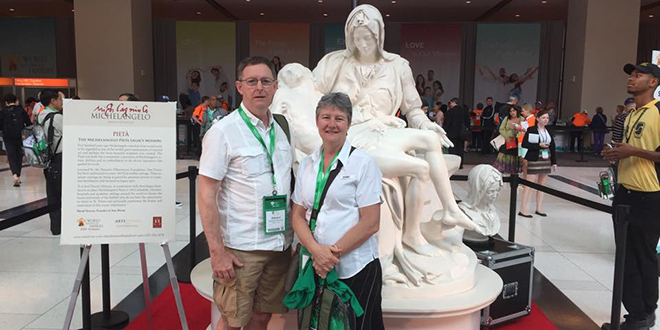 Challenging journey: Edmond and Ann O’Donovan are among thousands who travelled to Philadelphia for the World Meeting of Families, pictured here before the opening address and Mass. FINDING a seat at the Church’s largest gathering of Catholic families proved to be less challenging than the Congress’s opening address to make faith public, a Brisbane mum said. Ann O’Donovan and husband Edmond O’Donovan were among thousands of international pilgrims seated for the opening Mass of the World Meeting of Families in Philadelphia. The Brisbane couple were surrounded by people from more than 100 nations for the opening address by newly ordained Bishop Robert Barron and Philadelphia Archbishop Charles Chaput opening Mass. “It must have had the capacity to seat more than 10,000 people,” she said. The “tumultuous journey” proved worthy when Bishop Barron offered his “challenging” address the Christian response to God creating man in his image. “It was on the Imago Dei (the Image of God) and how, having been made as such, this provides the ultimate challenge for man,” she said. “I particularly like the challenge of campaigning as a king who should, when the season for him comes, go out into the world, unlike King David who stayed at home during the campaign season. Mrs O’Donovan said Bishop Barron’s address was followed by a “most moving Mass”, and estimated the entrance procession of priests, bishops, including Sydney Archbishop Fisher, and cardinals, had taken more than 20 minutes. “While such an elongated start usually frustrates me, to see so many from the consecrated life from so many countries, including Australia as I saw Archbishop Fisher from Sydney here, it was surprisingly uplifting,” she said. “The readings and prayers were read/prayed/sung in both English and Spanish which gave a wonderful universal feel to the whole thing. “Archbishop Chaput welcomed everyone and gave the Homily on the readings of the day, the book of Ezra and St Luke. The couple will attend the full meeting in Philadelphia but said they will miss the papal visit and concluding Mass on September 27. Mrs and Mr O’Donovan add to the list of Catholics representing the Church in Australia at the Philadelphia event, including chairs of the The Australian Catholic Marriage & Family Council, Armidale Bishop Michael Kennedy, who offered his thoughts ahead of the Congress, and a Darwin-based couple with four children. This is the first time America has hosted the World Meeting of Families and will include a visit from the Holy Father, Pope Francis. The Pope arrived on United States’ soil earlier this morning after a quick visit to Cuba, and is scheduled to preside at the World Meeting of Familie’s concluding Mass on September 27.